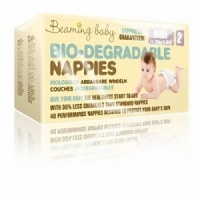 Beaming Baby biodegradable nappies have fewer chemicals than any other nappy on the market (30% less than high street brands). They have taken the UK by storm and Earthmother are supplying them to the parents of Ireland! They use 30% less chemicals than standard disposable nappies, dramatically reducing the chances of nappy rash and are kind to all babies; especially those with eczema or sensitive skin. Better for the planet; every nappy is 40% more biodegradable than standard disposable nappies. In total, they are 65% biodegradable (including the packaging)- one of the highest percentages on the market. 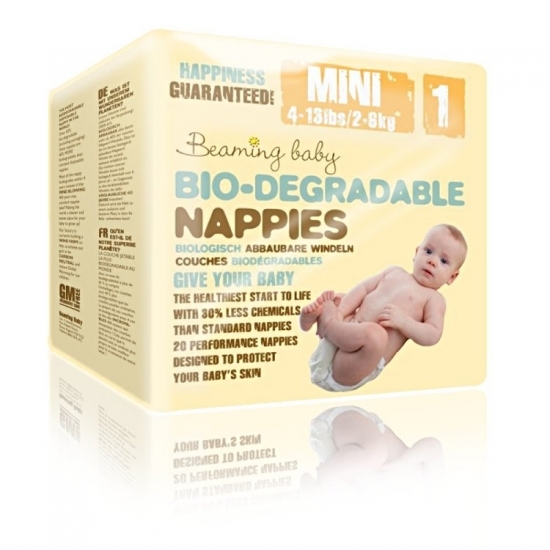 Most of the nappy biodegrades within 4 years instead of the mind blowing 400 years that standard nappies are estimated to take! The top sheet is biodegradable, water resistant and made with natural cotton and cornstarch fibres. The absorbent layer is fortified with 100% natural cornstarch. They are gently infused with aromatherapy oils including chamomile and ylang-ylang to help protect baby’s sensitive skin and release a gentle scent. 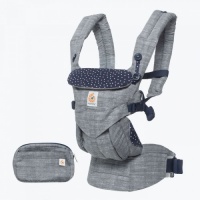 They form a naturally breathable layer against your baby’s skin.